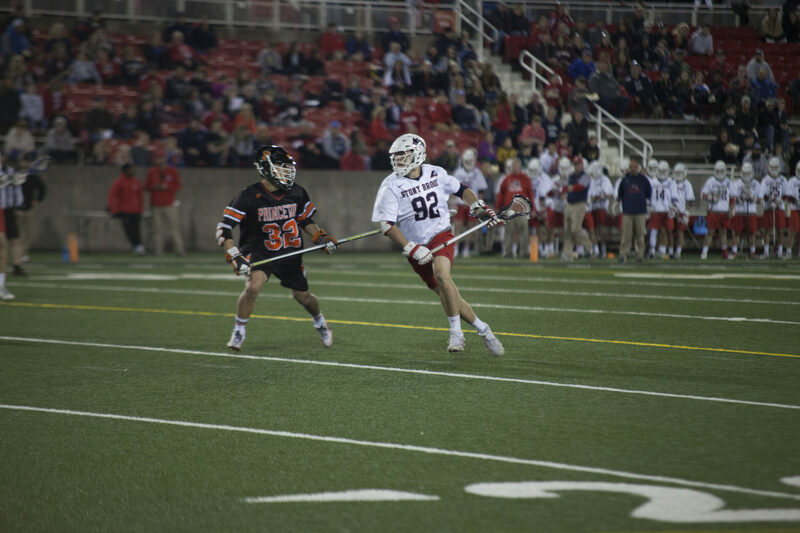 In what was an otherwise even game, Stony Brook Men’s Lacrosse’s ineffective shooting and inability to put the ball in the net made all the difference in their blowout loss to the Princeton University Tigers, losing by a final score of 14-4. Problems arose from the beginning, as the Tigers jumped out to a 5-1 lead by the end of the first quarter, which they would never relinquish. Princeton’s seemingly unstoppable offense was led by junior attacker Emmet Cordrey’s four goals and freshman midfielder Chris Brown’s three goals. Freshman Erik Peters kept the Seawolves off the board with 13 saves to cap off Princeton’s night. Despite leading the game in ground balls, 32 to Princeton’s 23, and faceoffs, 14 to their eight, the Seawolves shot an absurd 45 times and somehow managed to only put 18 of them on net. The Seawolves’ shots on goal that were not saved by Princeton were scored by junior attacker Cory Van Ginhoven, freshman midfielder Layton Harrell, junior attacker Connor Grippe and sophomore midfielder Mike McCannell. This poor outing comes off the heels of an electrifying win at St. John’s and right before the critical final stretch of the season. Each of the Seawolves’ remaining games are conference games, with the next two on the road and the final game of the season coming at home against rival Albany. When asked about how the team looks to move forward from this game into this crucial final stretch, Nagle had few words. The Seawolves begin their final stretch of conference games at UMass-Lowell on Saturday at 7 p.m.